A Soyuz spacecraft being prepared for an ISS mission last year. A NASA deal with Boeing gives the space agency access to up to five additional Soyuz seats, including three in 2019. WASHINGTON — NASA has quietly signed a contract with Boeing for up to five additional Soyuz seats to provide for both additional U.S. crewmembers on the International Space Station and margin for commercial crew delays. NASA made the deal in a modification to the Vehicle Sustaining Engineering Contract the agency has with Boeing for ISS operations. Other than the formal contract modification notification, posted Feb. 21, NASA did not announce the agreement beyond a statement published without fanfare on the agency's website. The agreement covers two Soyuz seats on flights in the fall of 2017 and spring of 2018, with the option for three seats on Soyuz flights in 2019. The total value of the contract modification, including the optional seats, is $373.5 million, or an average of $74.7 million per seat. NASA's most recent contract with the Russian state space corporation Roscosmos for six Soyuz seats on 2018 missions has an average per-seat price of $81.7 million. NASA disclosed in a Jan. 17 procurement filing that it was evaluating an unsolicited proposal from Boeing for the Soyuz seats. Boeing obtained the seats from Russian company RSC Energia as part of a settlement between the two companies for a legal dispute involving Sea Launch. Boeing won a judgment of more than $320 million against Energia from a federal court in May 2016, but subsequent legal filings indicated that the two companies were negotiating a settlement. The procurement filing was a procedural step before NASA and Boeing could begin negotiations for the sole-source contract. In mid-February, Boeing officials said negotiations with NASA for the Soyuz seats were ongoing. The near-term seats take advantage of open seats on Soyuz flights created after Roscosmos announced plans to temporarily reduce the size of its crew from three to two people, a move that takes effect in April. An additional U.S. crewmember, NASA claims, can result in a 50 percent increase in overall crew time for research on the ISS. NASA has planned to add an additional crewmember once commercial crew vehicles, capable of carrying four or more people at a time, entered service. NASA has not disclosed who will fly to the station on those two near-term Soyuz seats. "Crew assignments are going through the standard process that all [ISS] Expedition assignments follow," NASA spokesman Dan Huot said Feb. 27. "Once that process has been completed, we'll announce the assignments." The compressed timeframe would likely limit the available astronauts for those near-term seats to those who are already training or have recently completed training as backups for missions, or those who have recently flown missions themselves. Crew selections are typically made a year or more in advance of the missions: on Jan. 4, NASA announced that astronauts Drew Feustel and Jeanette Epps would fly to the ISS in March and May of 2018, respectively. The options for three seats in 2019 provide a cushion for NASA to ensure access to the ISS should commercial crew vehicles under development by Boeing and SpaceX suffer delays. "Although both commercial crew vehicles are on track right now to start flying in 2019, it seemed to us it might make sense to NASA to have some insurance just in case," John Elbon, vice president and general manager of space exploration at Boeing, said in a Jan. 17 interview. A U.S. Government Accountability Office report Feb. 16 concluded that Boeing and SpaceX were likely to suffer additional delays in the development of their commercial crew vehicles, delaying their NASA certification from the second half of 2018 until 2019. NASA, in a response to the report, said it was developing a contingency plan for ISS access that would be completed by March 13. Since the report, executives with both Boeing and SpaceX have argued that their vehicles remain on schedule for test flights planned for late this year through the middle of 2018. SpaceX Chief Executive Elon Musk reiterated plans to fly NASA astronauts in 2018 during a Feb. 27 conference call with reporters to discuss his company's plan to send two people on a circumlunar mission in late 2018, a mission he said would fly after SpaceX's first crewed missions to the ISS. 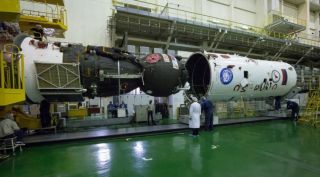 A potential gap in access had concerned NASA and its advisors, given that it was too late using traditional procurement methods for NASA to purchase Soyuz seats directly from Roscosmos for 2019 missions. The Boeing deal has relieved at some of those people. "It was good to assure accessibility to ISS and take some schedule pressure off, as it was being perceived, on commercial crew," said James Bagian, a member of the NASA Aerospace Safety Advisory Panel, during a Feb. 23 meeting of the panel at the Kennedy Space Center, alluding to the Boeing deal. "While we want commercial crew to proceed with all due haste, we don't want schedule to have unnecessary pressure that could compromise safety."